With the success of an idea on the web come clones, and services that refine the idea, or find a niche that is not yet dominated by the first mover. The success of Pinterest, which certainly was surprising to some, has sparked the creation of Pinterest-like sites for all kinds of things. We have seen music and video sites adopt the system the system in masses for instance in past months. Chill is one of the latest sites. 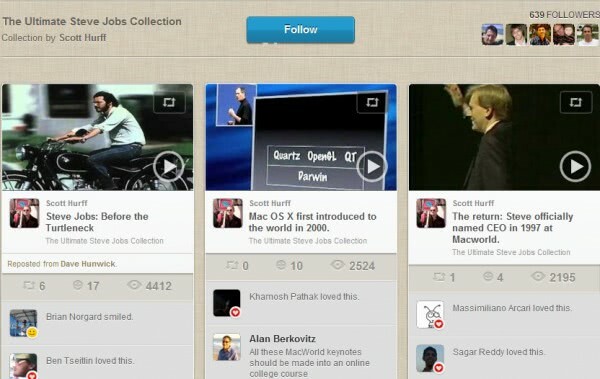 It is a video pinboard community where logged in users can post videos that they have stumbled upon, comment on and like videos, and create video groups like The Ultimate Steve Jobs Collection. Even the posting of videos on the site works in the same way. Just drag and drop the Chill bookmarklet to the browser’s bookmarks bar, and click on it when you have found a video that you want to post on the site. You can also click on the post a video button on the Chill website directly. Users can currently only register if they link their Facebook account to the service. While that is a comfortable option for some, others may not want to link their account or may not even have one. Since it is possible to post videos on Pinterest, the main question is if Chill is unique enough to survive on its own. And Pinterest is not the only site the service has to compete with. There are also regular video hosting sites, like YouTube or Vimeo that it has to compete with as well. When you look at the features it offers, you end up with a site that allows you to post videos into categories, make them available to others, and use the site as a video discovery service. ReadWriteWeb notes that Chill has received over 500,000 unique visitors in its first month, which definitely is an impressive figure. It is however too early to tell if the site will continue to grow in the next months, or if it is one of those one-hit wonders that you happen to see fairly often on the web. Have you tried Chill yet? If so, what’s your impression of the service?